Today it was fine weather. At first I didn’t plan on going but my wife suggested that if I wanted to take the Norton for a ride, I should profit from the good weather while it lasted. All went well, no traffic accidents, no heart attacks. In Sevres, while waiting for the red light, a car pulled up next to me. First I was thinking that it was again some kind of jojo that got his driving license for free with two boxes of cereal (after my experience yesterday where a car driver gave again a perfect demostration of how stupid some people are by passing at least 6 cars using the wrong lane before blocking himself (and others) behind a bus) but no; it was someone in a gray sportscar that rolled down his window and told me that he used to have the exact same model Norton Commando, but his got stolen some 20 years ago. But while on my way back, I already noticed, the right exhaust locking nut came out again. Once back home, it is in fact worse; also the balance pipe collar came loose. 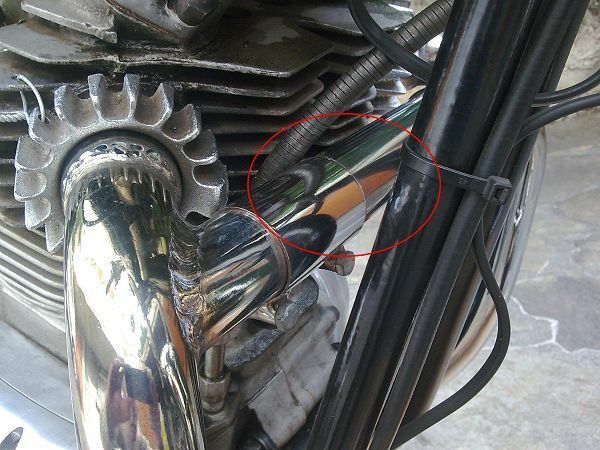 This also makes the right exhaust muffler swing out a bit, so the kick start hits it. At first I thought it would be easy; untighten the bolts of the balance pipe collar, move it over and tighten again, but .. I don’t know what they put behind it, it looks like a kind of glue, completely harden by the heat of the exhaust, that was ment to prevent unwanted untightening. 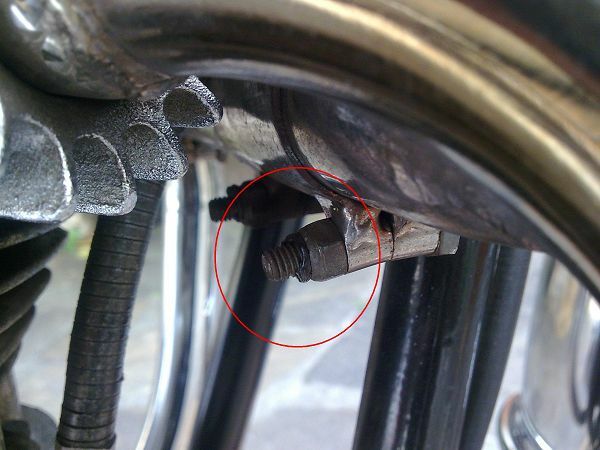 I tried, but nothing to do; impossible to untighten the nut/bolt. Glue behind the nut on the thread? Sure thing, the nut won’t move an inch, but now how can I do if I want to untighten it?? The only thing I can think of is trying and hoping the bolt will break through, remove it then and remplace with an other bolt. Or to use a metalsaw, cut it through, but there isn’t a lot of space to get a saw in there.. I’ll need to think for a bit, because even if I manage to retighten again the exhaust locking nut, there will still be free space on the balance pipe collar.